“We live in the poor heart of Ireland” John McGahern wrote about his beloved County Leitrim. I, instead, am in the heart of a wild beauty of Ireland, Inishmore in the Aran Islands. I sit in my room in Kilmurkey looking out on the North Atlantic down the coast towards Kilronan, fat raindrops on the window, hands chilled as the radiator doesn’t seem to work. My chaotic departure began two days ago. I was running late for the shuttle that would take me to the airport. I instructed my neighbor, who had volunteered to transport me, to throw everything on the dining room table into my carry-on bag. Later, I discovered my garage door opener and a pair of one-armed glasses has found their way into the bag. Meanwhile, I searched frantically for the special pants I had purchased for the trip. No luck. I threw everything I could see into my suitcase. As I settled into the car, shoes popped out of my open handbag. I made the shuttle and on the way to Newark airport rearranged my belongings. Twenty-four hours later on the train to Galway, peace and excitement sat comfortably within me. I had a seat all to myself, McGahern’s book of essays, and the green of Ireland outside my window. In his love song to Lietrim, he describes ancient hedges separating properties and left undisturbed as no one seemed interested in developing that part of the country. “The hedges are the glory of these small fields, especially in late May and early June when the whitethorn foams out into streams of pink and white blossoms.” As it was May 31st, I spent most of the trip looking for whitethorn and found them, just as he described, between fields dotted with cows, sheep, and sometimes horses. The Irish have a saying, “If you don’t like the weather, wait five minutes and it will change.” The sun had been out since we left Dublin, but as we approached Galway, the sky filled with large sooty clouds, dominating the flattened landscape. Given the upheaval when I left the states, I opted out of exploring Galway during the hour before the bus left for the ferry. I played it safe and sat in the Victoria Hotel directly across from the bus stop. The hotel, fixed up to honor its heritage, is overdone and inauthentic. However, the white and pink peonies in large vases atop sideboards were for real. 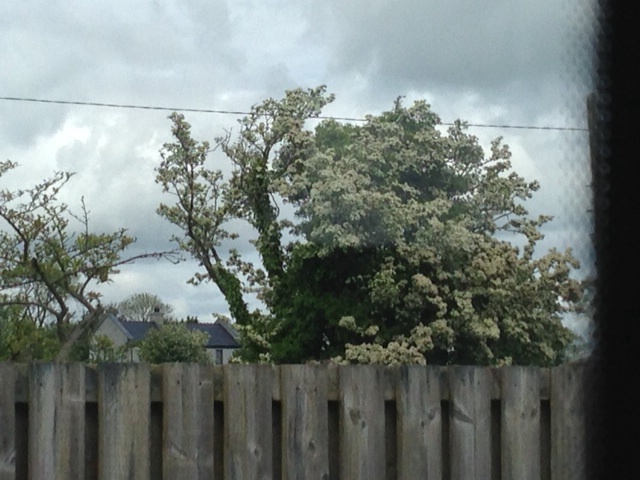 I wiled away my time gazing at thier large feathered heads and thought of McGahern and his whitethorn.